Located about 25 Km to the north of Oldonyo Lengai and making opposite with Kenya, this lake, in spite of its difficult access, is a marshy area, is advisable to visit. There are thousands of flamingos, mainly at the end of the rain season. Besides being famous for the discovery of remains of stone tools from more than a million and half of years ago. We could say that is one of the most unusual and surprising lakes, because in some occasions their waters are colored of a reddish color (due to the numerous concentration of marine algae combined with the salt that comes from the mountain). One of the reasons for visiting the lake is the ascension to Oldonyo Lengai, a volcano mountain that still is active. The trekking begins in the midnight and it usually lasts about 6 hours. 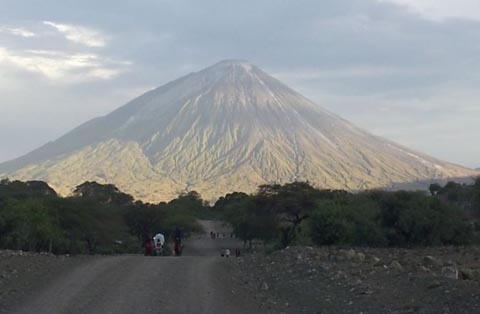 When arriving up, and if the climatology allows it, you can enjoy an impressive sunrise and fantastic views of Kilimajaro and Mount Meru, while the mounds of the volcano spit lava. After breakfast and resting a while, begins the descent that usually lasts about 4 hours. When ascending and descending it is necessary to be careful with the stones that fall from the mountain. It is necessary to keep in mind that it is difficult trekking and it is necessary to be physically very prepared.